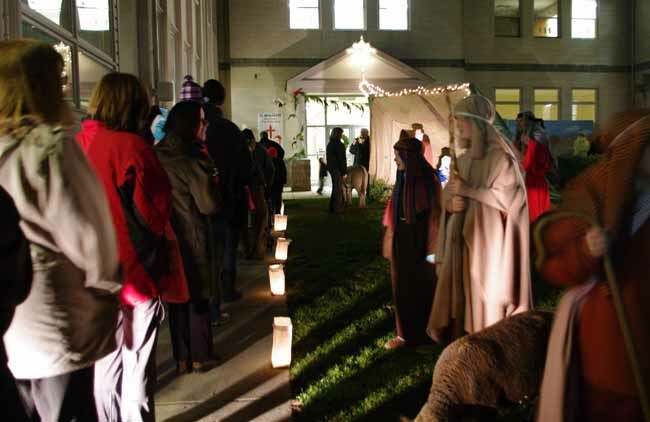 Visitors line up to enjoy the Live Nativity at St. Anthony of Padua Parish, Ambler, last year. For the fourth consecutive year St. Anthony of Padua Parish in Ambler will host a Live Nativity reenactment at the church at 259 Forest Avenue on Thursday, Dec. 4, from 6 to 8 p.m. The outdoor event involves 150 parishioners who work for four months to plan and produce it. The Live Nativity involves teams of volunteers from all parish groups portraying the characters of the Christmas story, plus live animals. Christmas music will play softly in the background as visitors walk through the scene enacted in the parish’s school yard.